The next morning, still a bit fuzzy from the Kush, we collected ourselves and made a day of it at Universal Studios Hollywood. I think Joel was slightly aggravated about the rest of us toking up. The lingering effects sure made the rides at Universal fun. Most of the rides were stationary, three dimensional experiences as opposed to high flying roller coasters and were themed around popular movie franchises — Transformers, The Simpsons, The Mummy, and so on and so on. For me, the highlight was the studio back lot tour where you board a tram for a behind-the-scenes glimpse of famed Hollywood movie sets. And ingenious works in progress. Amazing how well the lens can fool you. Later that night, Jastine, Cheng Yew and I took in a Dodgers game. This was a sentimental stop for me, having grown up an Atlanta Braves fan and watching many a battle with Los Angeles’ boys in blue. Dodger Stadium is one of the older ones in Major League Baseball, its tall swaying palm trees a familiar sight from years watching Ted Turner’s superstation. Just being in the stands on a clear and cool night in Chavez Ravine, munching on a Dodger dog was pretty damn awesome. The game not so much. A pitcher’s duel won by the visiting Philadelphia Phillies. I hate the Phillies. On my final day in LA, we soaked up the syrup at Roscoe’s Chicken & Waffles before visiting the La Brea Tar Pits. Roscoe’s was a homage to Southern cuisine and would be the closest my Singaporean friends would get to a Dixie fried delicacy during their American tour. Best I could tell, they enjoyed it, despite still not budging on the tipping procedure. At the tar pits — another lasting image of Los Angeles seared into my memory by the entertainment industrial complex — we got a tour of the grounds given, surprisingly enough, by a recent Auburn University graduate. 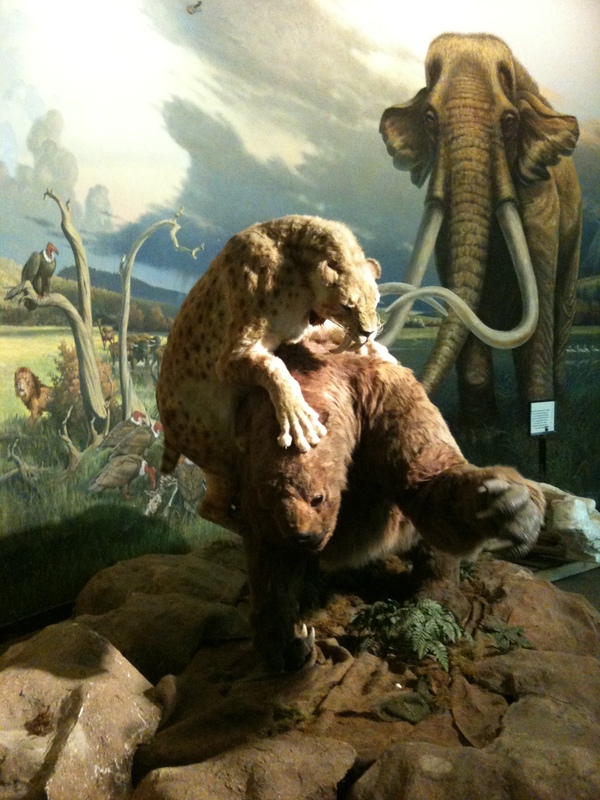 It was here, that I learned California’s state fossil is indeed the saber toothed cat. After the tar pits, we returned to Hollywood for one last meal together and shopping before I had to catch the train back to Arizona. Large crowds were gathered outside the Chinese Theater for a premiere of the dance movie “Step Up Revolution.” No one in our group seemed interested. We ate at a sports themed restaurant. SEC football media days were on the TV sets. I explained to Joel this was the dominant college football conference. Winners played on those teams, I said. Joel loved soccer as did Jastine. And Desmond, my hiking buddy. I watched the Singaporeans join with the Turks to beat the French, Bulgarians and Americans — beat them badly — at the Grand Canyon Recreation Center’s annual East vs. West match. The French group came out to the Canyon in mid summer and the women reinforced every negative stereotype I could imagine. The guys were actually very cool and I learned quite a bit about Parisian culture, particularly from this one Moroccan. More on him, later. The Turks were aggressive on the field — the exact same field that would be transformed, later that night, into grazing grounds for a herd of elk. 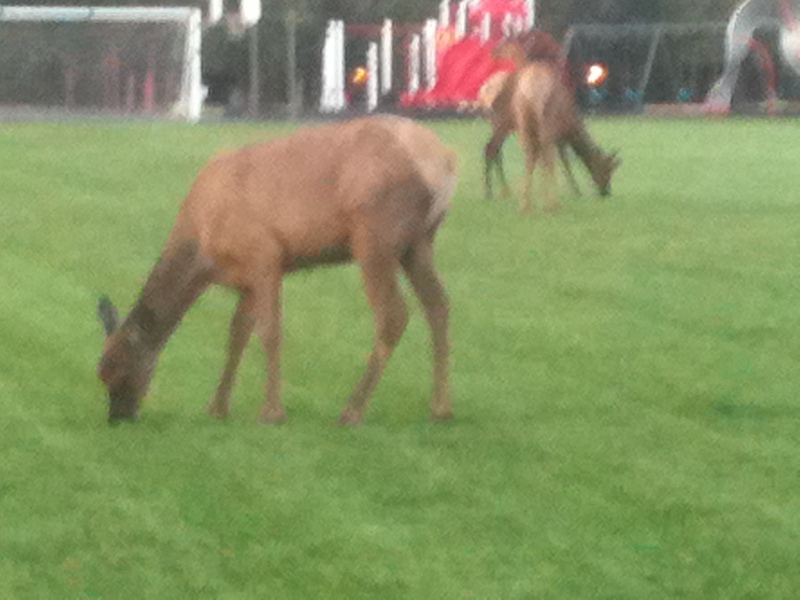 The elk were a constant reminder of our wild living conditions, far from the streets of Paris. One of the Bulgarians nearly broke his leg that day. The Turks were relentless and not even a stout American goalie could stop enough of their advances. The match would become the subject of much conversation at the employee cafeteria. 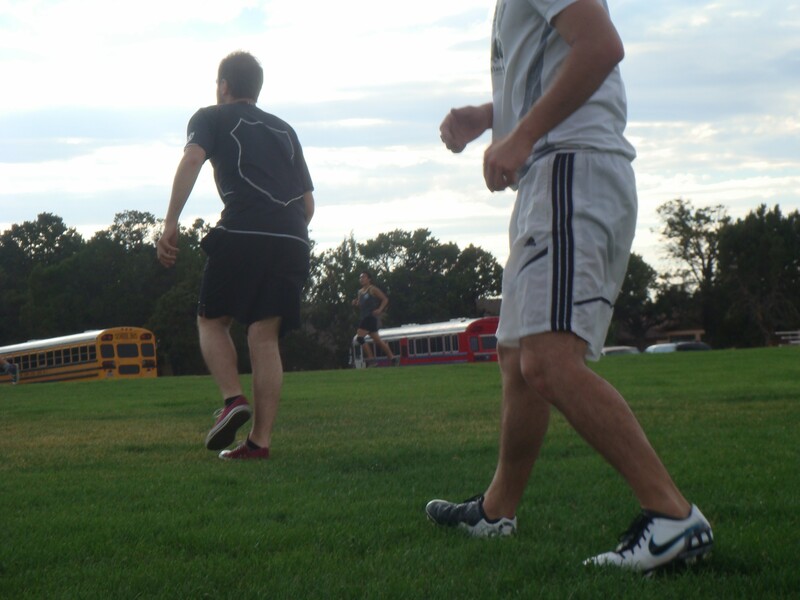 Soccer was all the rage during the summer of 2012. It was not entirely foreign to me. I played the sport as a grade school kid in the Orlando suburbs. I recall being self conscious about my shin guards being bigger than my legs. Quite the challenge being the smallest one in your class or on the team. So, is there actually tar in the La Brea Tar Pits today? I’ve heard of them, of course, but have never quite been able to picture. Also, I, myself, find American football puzzling, and I’ve lived in this country all my life. Yes, Don. It’s still seeping to the surface. Quite a team of scientists working there as well. @Jastine, You are right. We had Sativa the first night. Wish I could have went inside the dispensary with Normen to pick it out. :-D.
Im pretty sure you guys had the kush on the first night cos i missed out on the good stuff. I cant even remember that the second one was called Sativa. haha – good times!